Background: In the 2012 combined ADA and EASD consensus statement on the management of T2DM, the listed advantages of insulin included “universally effective” and “theoretically unlimited efficacy”. However, in the same year we reported an average HbA1c of 8.1 % amongst 2000 T2DM patients treated with insulin under the supervision of Australian endocrinologists (DINGO). Aim:To further characterise the efficacy of insulin in real world practice by studying temporal changes in HbA1c over 4 years following the initiation of insulin treatment. Method: De-identified data of patients with T2DM were aggregated from the electronic medical record of endocrinologists using Audit4 (Software 4 Specialists, Australia). Inclusion criteria were: insulin initiated on or after first visit, baseline HbA1c >7%, and at least one more HbA1c recorded in first 2 years. Data was analysed using a linear mixed effects model. Of 10,756 patients with T2DM, 522 (57% male) fulfilled the inclusion criteria. Insulin was initiated an average 3.3 y following first consultation, at which time the mean age was 58.6±12 years, mean baseline HbA1c 9.4±1.6%, mean BMI 32.8±6.3, and average disease duration 6.8 years. 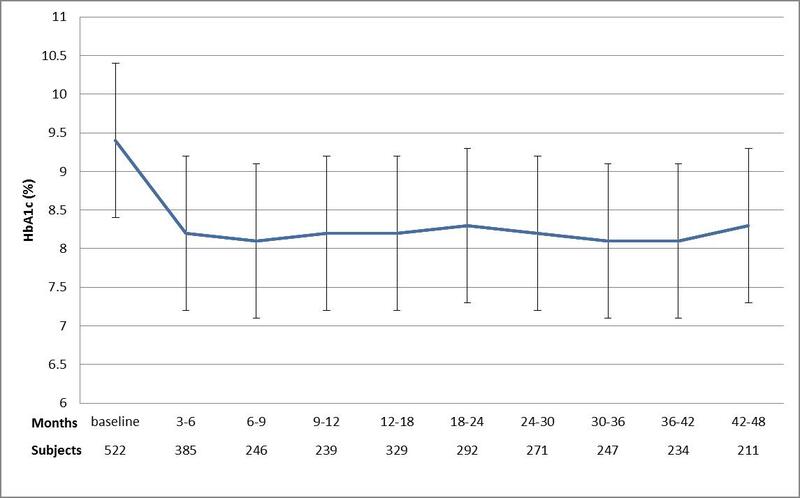 There was a mean 1.2% reduction in HbA1c in the first 3-6 months (p<0.001), after which no further improvement occurred. During the period of stable improvement, 20% of patients reached target HbA1c of <7%. Discussion: Our data indicate that the commencement of insulin in the specialist arena results in a rapid reduction in HbA1c with the improvement sustained over the medium term. However, the improvement is modest and the majority of patients fail to achieve standard HbA1c targets. Conclusion: For the majority of patients with type 2 diabetes, insulin in itself is not an effective means of achieving HbA1c targets. The expectations of efficacy of insulin are unrealistic in the real world.